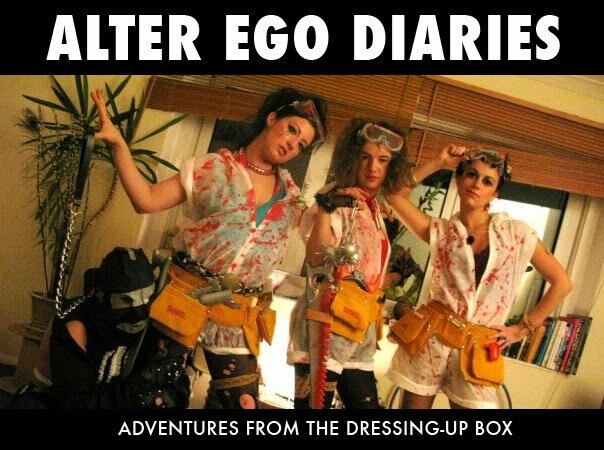 Alter Ego Diaries: Bestival..the final show down. The main Besitval affair for us was of course shooting stars, but I could not handle the thought of spending a night at a dressup festival, without ...well... being.... dressed up! Surely not. Criminal. So I wizzed something up in the last few days in London. It is nothing specific exactly.. rather an alient fighter chick type thing I guess. To be honest, I had this cool leather mask I had bought in Barcelona during the summer and had been waiting for an opportunity to wear it so based an outfit around that. When I was shopping in Kleins for Madonna stuff I came across these hollow gold tubes that make cool shapes. So I attached them to shoulder pads and filled them with LED lights for night time fun. Hannah kindly lent me her gold sequin cardigan thing I used to attach shoulder pads too... Thanks Hannah! As a final touch I also bought these naff 80s gloves on ebay which were so wrong they were right. That's it really. 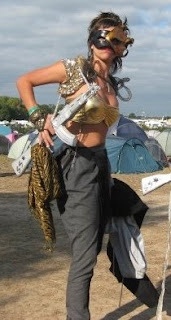 Nothing ground breaking.. but with the recycled Madonna gun used from 'Shooting Stars' the night before I was definitely ready to bust up some aliens ghost buster styles.